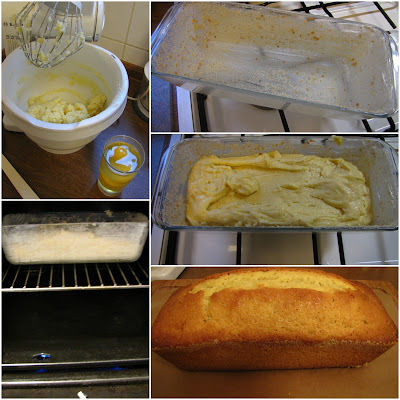 While I was surfing last week on the Internet and Facebook - Click here to check my Facebook-Page - I found an interesting and fast recipe for a pound cake. I thought it might be a nice idea to try something new (not always my Milan cake), just a coffee cake maybe for lunch at the office or for my granny or just for fun. I had a very busy week and at its end I was on the best way in getting a cold. Yes, I was getting but I had luck and did not. I jumped into my bed at the very first symptoms and today, after two days I spent in bed, I am luckily the good old guy. And I am bored because I had to cancel a date with a friend today. I thought it might be better to stay at home for one day more. You'll find the recipe for the Old Fashioned Pound Cake by clicking here. Because I am a fan of kitchen scales, I converted the amount of flour - it's 9 oz flour (270g) and two sticks of butter (great! I had to check what two US sticks of butter are!) are exactly 230 g butter (+/- 8 oz). Finally I made the cake and imagine what (a friendly wink to a blogger friend!) I didn't burn the cake. I tend to burn cakes sometimes but I learned that the best thing for baking in old gas ovens are baking pans made of glass. Since I use them: no burned cakes anymore.